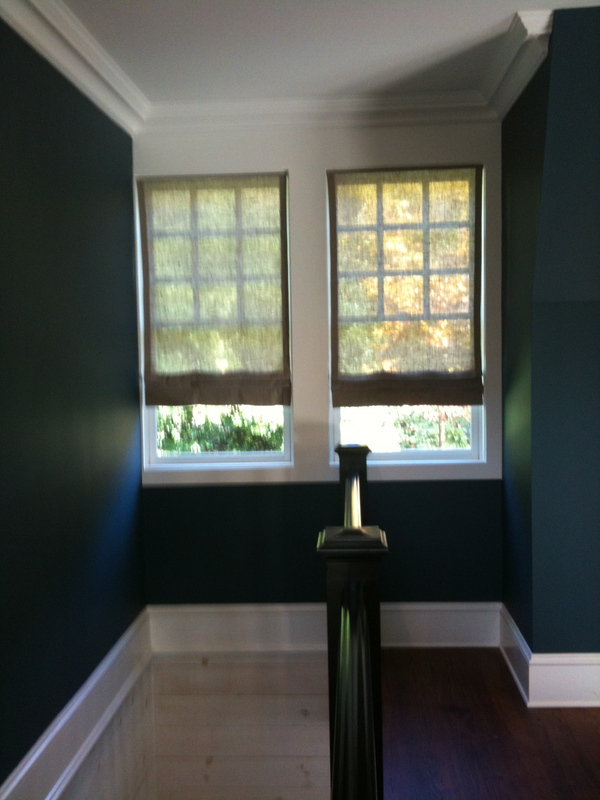 Bay window treatments are always a challenge. Custom angle, bends, proper widths, matching fabric where they meet in closing. There is much to consider when “navigating the bay”. We recently completed an entire home of window treatments, which was topped off with dramatic panels in the master bedroom bay window. This homeowner had been in the throws of a full house renovation that had been going on for several months. We added treatments to all the rooms. 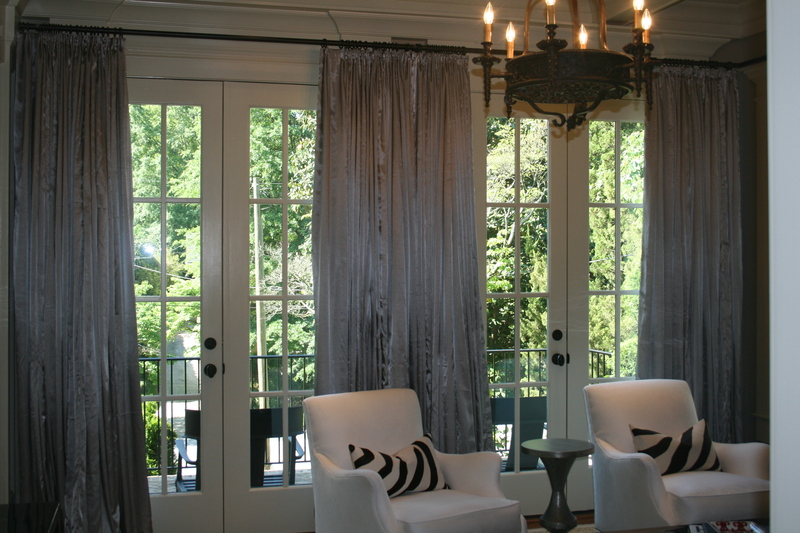 For her downstairs, kitchen bay area, her preference was roman shades, outside mounted to finish and soften. 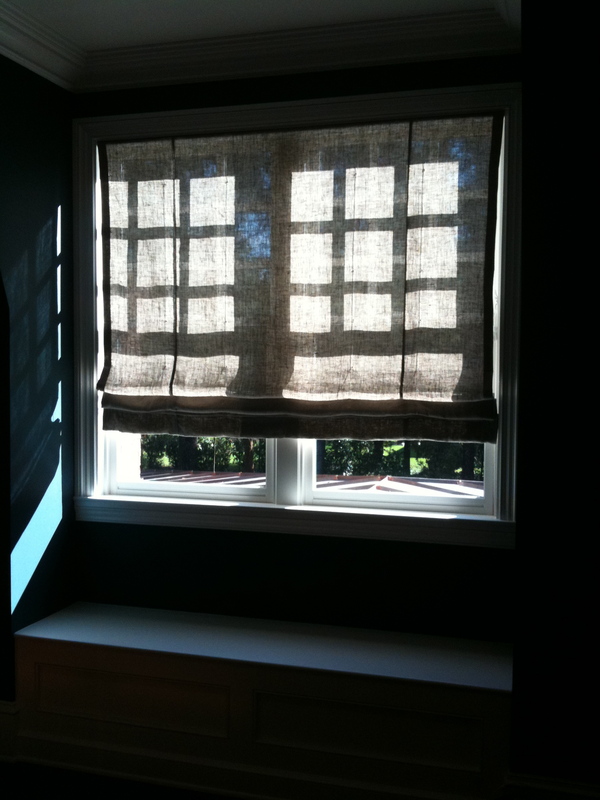 outside mount, linen roman shades in the kitchen bay, clean and soft. But when she and the designer began to dress the master bedroom, they wanted something more luxurious and “worthy of the space”. The duo first asked for roman shades, like the breakfast area, but after much discussion, drapery was decided to be the very best option. Besides aesthetics, (what could be more beautiful than drapery?) there was also a need for full privacy and light reduction. As the homeowner put it, “we were tired of waking up with the dawn!”. The only concern was how to manage the bay. Would it look good? Was there enough room for the panels on either side – with a fireplace flanking the left and partial wall bordering the right? One of the great things about bays is that the panels do not have to be overly full. You can complete the look and minimize the fabric needed between windows because you are sharing the coverage – this allows for less use of space on the far sides of the windows. 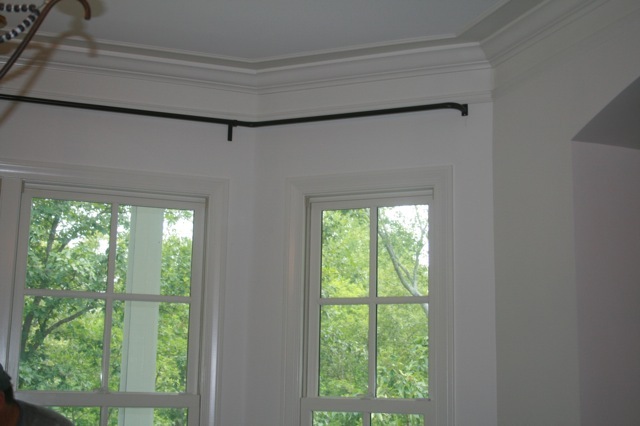 Measuring a bay window is the first and most important step to getting this challenge right. At Drape98, we use a special angle measuring device that records the bay angles at an exact degree. Our hardware is custom bent to precise specifications and then deductions are made for each piece of the rod to perfectly connect based on the proper projection. Carefully spaced brackets and evenly spaced panels complete the picture and offer a truly custom solution. Note the bend at the slight angle in this photo. Instead of using a corner bracket, the bend is actually just left of the corner /bend, where, a few inches beyond, the rod is spliced for bracket placement. We returned the rod to the wall just at the next angle which flanks the room dividing wall. A bracket off center of the bend looks odd at first, but take a look below when panels are added. Panels are strung between brackets, and laced rings over rod connections allows for a clean look – custom rod bends, perfect panel coverage. Have a custom bay project you need to complete? Trust the experts, trust Drape98! We have the experience and know how to make your “bay” project perfect! We recently completed an installation for a talented designer/retailer group in Atlanta. 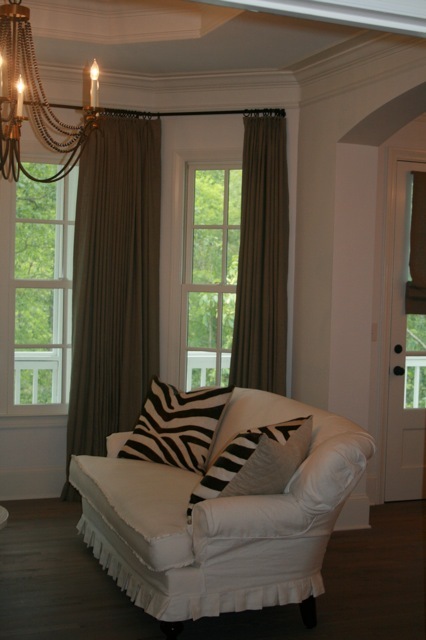 They have been working with a client as she settles her home with new furnishings and finishes. Because she and her family may be relocating soon and window treatments usually stay behind, the client was not anxious to spend a lot of money on drapery fabric. As a result, she chose a very reasonably priced satin fabric for double europleated drapery to complete her living and dining rooms. Fabric can make all the difference in drapery fabrication. Any workroom can tell you that some fabrics are a breeze to work with and some make you want to get out of the business! Working with a “dress” weight satin does have it’s challenges- and in some cases might not be suitable for drapery. After inspecting the fabric, we knew some hand sewing would be required to keep the seams smooth and eliminate puckering. (Machines tend to pull and add tension- can’t be helped). We also realized that this lighter weight fabric might not drape as well as the client would like. To tackle these issues, we started with adding a higher quality, 100% cotton liner along with a light interlining. Doing this added weight – which helped the fabric “drape”. We also decided to use a stiffer buckram than is normally used for our europleated headers; giving the pleats a more defined shape. The result was a truly stunning drapery. 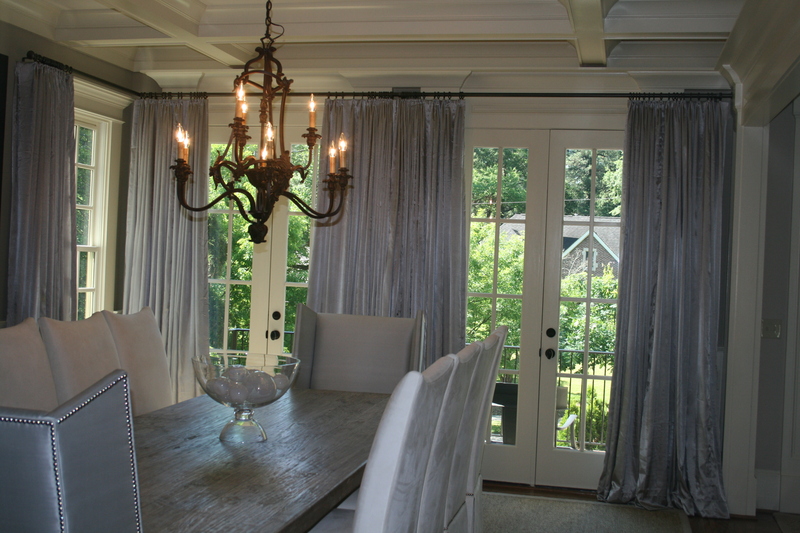 The dining and living rooms are now finished, with the drapery adding just the right amount of sheen and luxury. The hardware was a continual in both rooms; treating all windows as one. A 1″ diameter, pewter finish in iron – all custom- with very little bracket obstruction was designed. One of the most rewarding parts of what we do is working with visionary designers. Taking a design idea and bringing it to life takes attention to detail and a knowledge of what our clients are trying to create. It’s our job to know what fabrication technique is needed to make it happen. Mirror Image of the Living Room... Satin and Sensational! Check out how wonderful the rooms look! As always, drapery helps complete the overall design and we are proud to say that all clients involved are more pleased than they thought they would be! Have an upcoming project? Trusting the right workroom to complete your vision can be scary. We work hard to make the finished project just what everyone is looking for… sometimes even better! Don’t miss the Atlanta Homes Christmas Show House, now open. This William T. Baker designed New England style home on West Wesley Road is stunning. Several top area designers and retailers have showcased their wares and talents and it truly is something to see! The ever talented Courtney and Randy Talinski of Bungalow Classic commissioned Drape98 to fabricate treatments in their carriage house design space. We used our signature Oatmeal Linen and kept the shades unlined and simple to offer softness and warmth to this classic, cozy space. This is one home you don’t want to miss. The house opened to visitors on November 14 and will remain open until December 6th – Hurry! Online tickets are $20. Adult tickets are available for $18 in advance and $20 at the door. All proceeds benefit the Atlanta Children’s Theater. This is a perfect way to get into the Christmas spirit and inspire great ideas for your home! 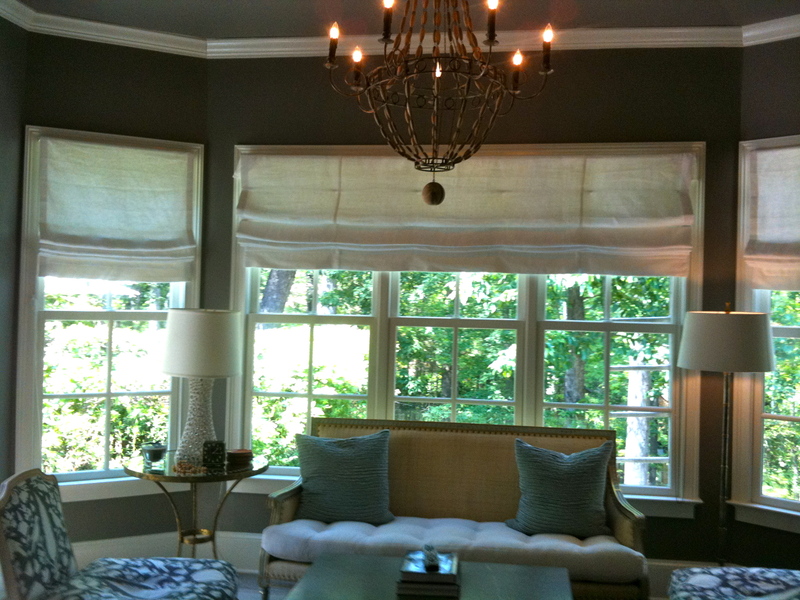 Drape98 Oatmeal Linen single shade in large window seat area - Note the light still filtering through!